Stuck in a Color Rut? Try Using a Color Grid. Whenever I find myself repeatedly (and often unknowingly) reusing the same color palette and find I am in need of a change, this exercise often helps me break out of my color rut. I think of it as an artist's equivalent to an opera singer/musician practicing scales. This can be done with a variety of media (my next post will feature a digital color grid using Adobe Illustrator) - I have chosen to use Prismacolor pencils for three reasons. 1. 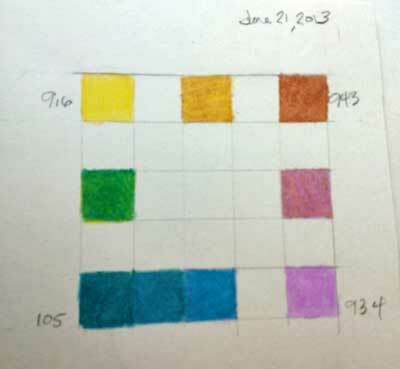 You can choose a specific color that will be consistent over time and record it for future reference (I use the three digit number listed at the end of the pencil), 2. For their color mixing properties/ability to manipulate blends by layering, and 3. Can transport a wide range of colors and not worry about paint spills. Steps 2-3 complete. Beginning #4. Lightly draw a 5 x 5 square grid with pencil (2b or H will do). 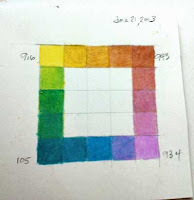 Choose four colors to use as base colors. Place one color in each corner. 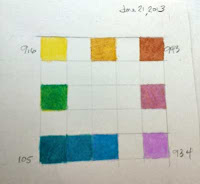 In the middle of each row, mix a color that is between the two end colors (the hue should be the middle point - not leaning toward one end more than the other). If using colored pencils, you may want to lightly dampen a cotton swab with rubbing alcohol or Turpenoid to remove some of the colored pencil buildup in between layering strokes. 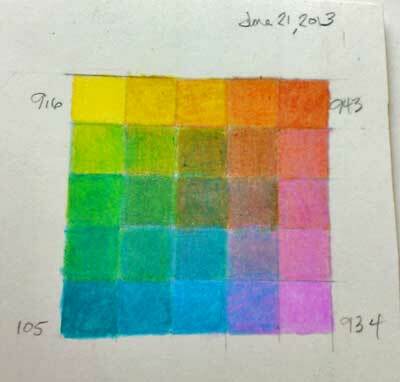 Do the same all around the outside blocks of the grid, filling in the blank squares with the color mixture that is the midpoint between the adjacent hues. Find the center color by gradually building up layers of the four colors and looking at the colors that need to meet in the middle (vertical, horizontal, diagonal). Depending on the four colors selected, this may often be a chromatic gray.